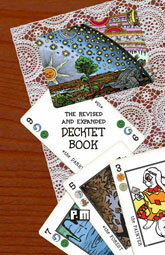 The Decktet Book book is over 230 pages, covering the deck's history, both genuine and arcane; its structure, detailed in numerous charts and tables; games that exploit the unique features of the deck; suggestions for reading and interpreting the cards. The Revised and Expanded edition is about twice the size of the original and adds a selection of the best games invented by the Decktet community. There are over thirty games included in the book. The book combines text and rules that had previously been available from disparate places with new material, presenting them together in a unified way. It includes over one hundred original and historical illustrations. The book was released in February 2010; the revised edition in October 2011. It was written by P.D. Magnus (creator of the Decktet) and incorporates material by numerous contributors. It is available print-on-demand from Lulu.